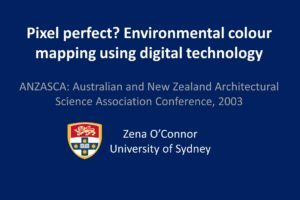 This peer-reviewed conference paper explored a new method for environmental colour mapping using digital technology. The paper was presented at the 37th Australian and New Zealand Architectural Science Association conference, 2003. The paper explored similarities and differences among environmental colour mapping methodologies. One common approach involved manually collecting samples. The samples were then visually checked against colour notation systems such as Munsell or the NCS system. The new approach involved identifying colours using digital technology and high-count pixel photographs. This second approach provided many benefits but also some drawbacks. Exploring environmental colour mapping using digital technology formed the first phase of my PhD research. Feedback from the conference presentation served to inform the next steps of my research.